Goons like Eric Boulton tend to break Graphs featuring Neutral Zone Data in very……..not-good ways. A little over 2 years ago, Eric T. introduced us to the idea of tracking play in the neutral zone, in the form of tracking “Zone Entries.” Zone Entry Tracking is now being done by trackers for a few different teams (Isles, Canes, Ducks, Kings, Sharks, Flyers, Caps, and more here and there) although not most teams’ data has not been collected yet such that people can compare players across teams. That’s something I’d like to change, so I will be using this space to acquire data from various teams and compare teams and players. That said, I’d like to explain how we analyze neutral zone data in the first place. Most Neutral Zone trackers track using a spreadsheet created by Eric, which collects the time, player, and type of each entry. That sheet compiles the 5 on 5 and 5 on 5 close individual #s of each player (How many entries, What % of entries were via carry, how many shots per type of entry, etc.) and the team. What percentage of opposing entries against a player come via carry-in instead of dump? 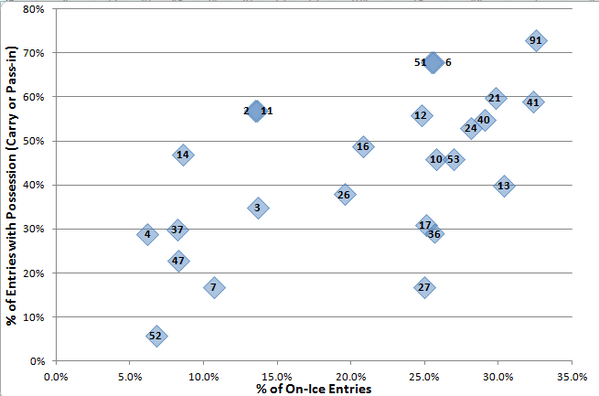 Overall Entry % of the team with a player on the ice. 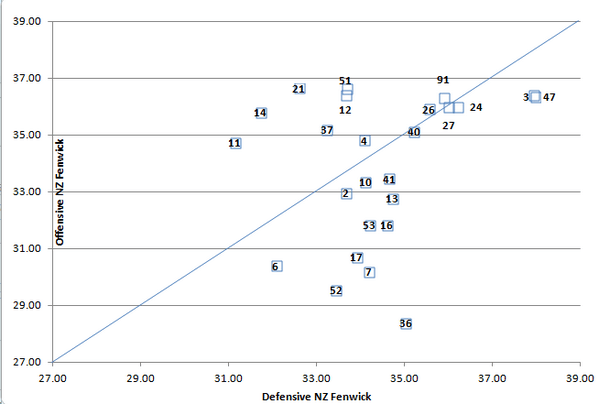 Neutral Zone Fenwick – What’s the expected fenwick % of a player based upon his neutral zone #s? This first graph (above) showcases the individual Neutral zone play of each player (in this case, the New York Islanders from last year, as marked by uniform #). So you can see that John Tavares (91) took the biggest role in the neutral zone and carried in a ton, while Matt Moulson (26) barely did so at all. Guys in the bottom right (#13, Colin McDonald) enter the zone a lot but do so inefficiently, while guys in the top left (#51, Frans Nielsen) do so efficiently but less often than others on their lines (The actual left side of the chart contains all the D Men). This graph is again pretty simple – and again, it’s the 2012-2013 Islanders: on the x-axis, we measure the amount of entries by opponents per 60 5 on 5 minutes with a player on the ice, while on the y-axis we see the % of those entries by the far more dangerous carry-ins. The bottom left side of the graph (where #11 Visnovsky, and #14 Hickey reside) showcases the elite defensive NZ performances, while the top right showcases the truly dreadful (the pairing of #3 Travis Hamonic and #47 Andrew MacDonald). The top left and bottom right showcase players who succeed in one way and fail in another. One comical thing about these graphs is that goons’ awful performances are pretty obvious – that’s #36 Eric Boulton requiring the x-axis to be stretched just to accompany him all the way on the right. This graph is my favorite, because it showcases the total picture that neutral zone data gives us. On the x-axis is “Neutral Zone Fenwick Against Per 60” – or the amount of unblocked shot attempts we’d expect with each player on the ice per 60 minutes, based entirely on his neutral zone play. The fewer shot attempts, the better, just like normal fenwick. On the Y axis, we have “Neutral Zone Fenwick For Per 60,” which is just the offensive version of that same thing. 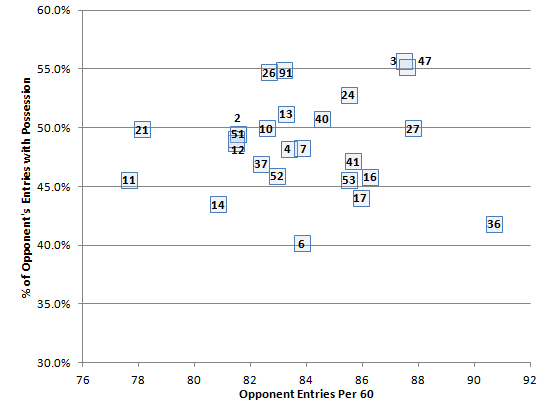 Hence, we show here both offensive and defensive neutral zone performance all on one graph. The blue diagonal line is the break-even point – players below that line are net negatives, while players above that line are net positives. So via this graph, we can see that the Isles top line last year (26-91-24) was elite offensively in the neutral zone but were just as bad defensively, resulting in very energetic back and forth play, while the Isles second line was just as good offensively in the neutral zone while actually being quite solid defensively (That’s 21-51-12). The Isles Fourth-line was okay defensively, but were dismal failures offensively in the neutral zone, and their goon once again broke the chart (this is a common theme). A final note: Neutral Zone Tracking is not an objective method of tracking stats and is to a decent extent subjective, just like most hockey stats are aside from goals and assists. As a result, various trackers may be a bit more stingy or lose with tracking, and thus per 60 minutes results of players between teams cannot be compared as such between teams tracked by different trackers. This will affect those last two graphs if we try to put two or more teams together at once. We can fix that by using relative versions of these stats and we’ll see how that looks. And that’s it for now: stay tuned, you’ll see a lot more of these kind of graphs and more involving neutral zone play of various teams in this spot over the next few weeks. Love this stuff; any clue how many games of data a person would want before having some confidence in the percentages? It’s at least a decent amount repeatable through say 24 games from my look last year – Will be looking at this for sure in the coming weeks. I’m really interested in seeing neutral zone tracking being done on a league-wide scale. Just an interesting way to tease out individual play better. Btw, I’m guessing zone exit data will also be important in evaluating defensive play, am I correct? 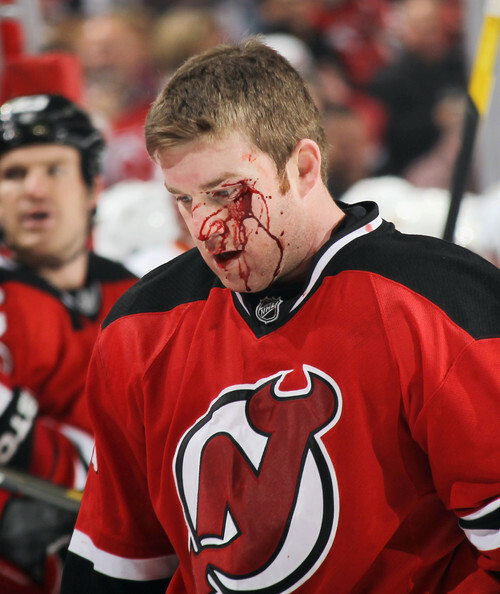 As for Boulton, I bet Colton Orr/FML would punch into that graph of yours, creating a black hole. They are just… UGH!